When it comes to office equipment, printers are one of the top priorities that should be on any businesses list for what they need. For businesses, printers and copiers are now one in the same. You can get the printer that you need for your business, as well as the copier that you want. Here are some things that you will need to think about when you’re preparing to get a new printer or a second printer for your business. Although there are a variety of printers, there are really two standard types of printers from the manufacturing perspective. They are monochrome and color. After you establish whether you need a monochrome or color printer, then you can begin to think about the size of the printer you need as well as the best printer for your business’ budget. Now that you’ve decided on what type of printer you need, it’s time to think about which printer features your business needs. For example, if you will be printing a high number of sheets per month, then you’ll want to make sure that your printer can produce a high volume of pages while conserving ink. Some of the top printer brands known for working best for businesses are Canon, Brother, Epson, and HP. Each of these brands have an option for businesses that may need a printer with a small footprint and also have budget friendly options as well as high capacity printers. If you need printers that come with copier heavy features, then you’ll want to look into brands like Ricoh, Koycera, and Xerox. These brands are known for being a hybrid type of copier printer for businesses, especially ones that do a high volume of printing. What Should my Business do From Here? Ask a professional! 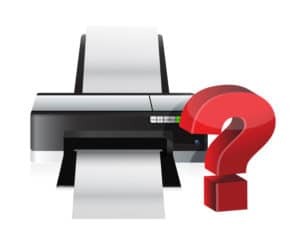 Hearing someone else ask the questions you need to know may help you realize exactly what type of printer you need to get. Reach Technologies can help you navigate your atlanta printer sales and copier sales questions.